Every morning I open my Facebook news feed and between kitty kitty photos I usually see some pictures attracting my attention to ecological issues, degradation of environment, or articles calling me to ‘go green’. The same situation is in my email box. It seems that global ecological issues caught global attention. The question is what can we do with them? 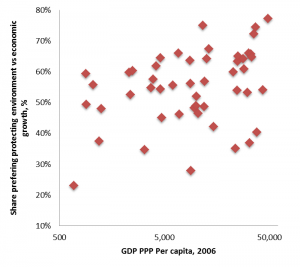 There are long-standing debates about ‘environmental Kuznets curve’, which suggest inverted U-shaped relationship between development and environment—environmental degradation tends to get worse as economy grows, until some income level is reached and the trend is reverted, as countries start valuing clean environment and have money to invest in it. However, attempts to find environmental Kuznets curve in vivo did not bring conclusive results. World Values Survey is a multinational poll, asking people about their values and attitudes toward different issues. Survey conducted in waves and we used most recent, 2005-2008 wave. Among other questions, it asked people what is more important for them—economic growth or protecting environment? People also responded if they are ready to give a part of their income for environment protection. 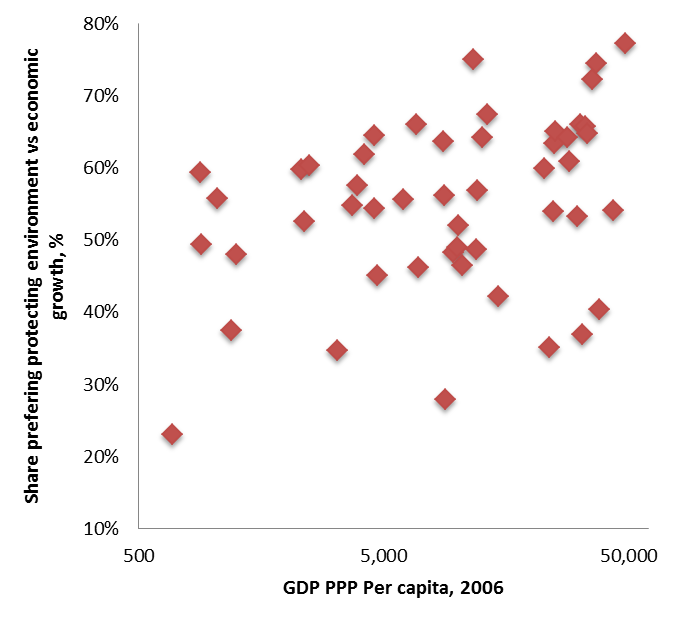 We also complemented these perception data with GDP per capita numbers from WorldBank database. 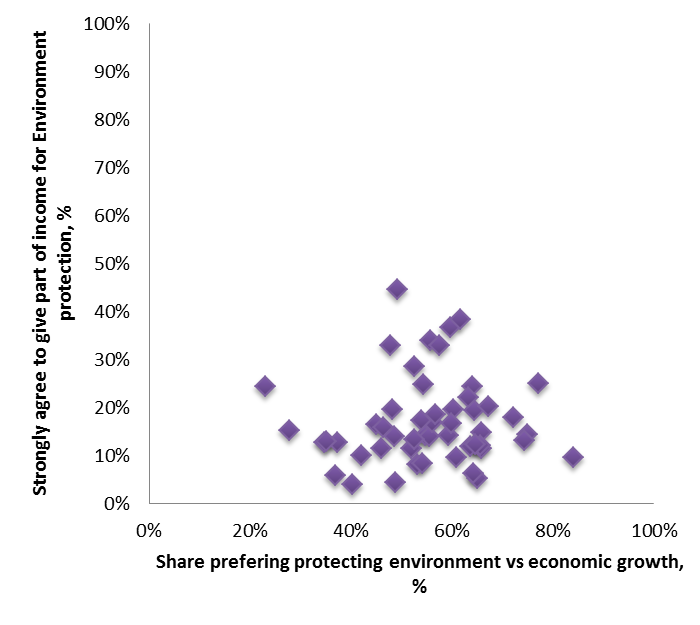 First results were not surprising—the share of those who prefer protecting environment over economic growth had positive correlation with income level. 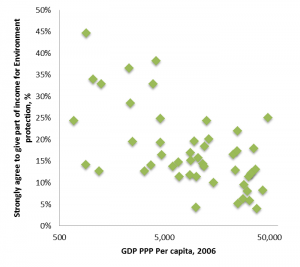 In other words, the richer is a country, the more attention people tend to pay to environmental protection. (Of course, correlation does not imply causality). That the sort of things we expected. However, distribution seems to be rather ‘flat’ and, moreover, there is huge split among rich countries in their growth vs environment attitude. By the way, the picture is for more economically cheerful period of 2005-2008. With economic crisis hitting countries, especially developed ones, attention could gravitate from environmental protection toward economic growth. However, if we plot desire to give part of income for environmental protection against income level, we will find negative correlations. 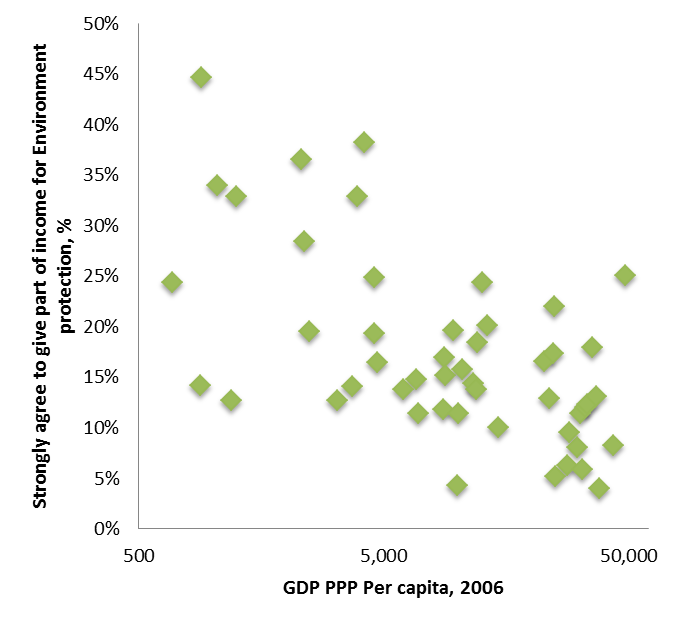 In other words, the richer is a country, the less desire have people to pay for environmental protection. (Again, this is correlation, not causality.) This finding is quite striking for me. I could see two reasons for this. First, the majority of people in richer (or more developed) countries do not face immediate impact of environmental problems, due to higher urbanization and bigger share of industry and services in economy. In richer country ‘deforestation’ could mean lack of nice parks for a walk. In less developed country deforestation could mean lack of fuel to cook and products to maintain livelihood. Second, more developed countries typically have stronger governance and higher taxation, consequently expectations could be that the Government should sort out environment issues without additional contributions. The picture gets even more intriguing if we look on preferring environment over economic growth and desire to pay for it—it seems that there is no correlation at all between them. In other words, people seem to like environment, however expect that someone else would pay for it. Clicking ‘Like’ on yet another Save the Planet picture doesn’t make much sense. The big issue is how to include environmental concerns into a bigger economic picture and how to finance environment protection? On a personal level I switched to public transport, walking to work, and double side printing. What could we offer for societies at large? 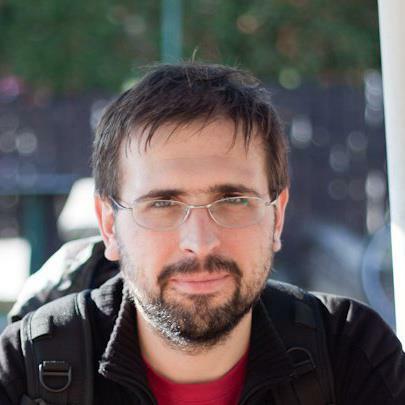 This blog post is also available in Russian. Sustainable Human Development Index: What exactly we try to measure?